I have been contemplating the lyrics of a song by Michael Card regarding the betrayal of Jesus. Those words have echoed in my ears since I was a teenage boy. They haunted me, actually. I have spent hours and hours mulling over Judas’ horrible act. Jesus let Judas into His circle of friends. Intentionally, Jesus called Judas to follow Him. He called Judas just like He called each of the other disciples. They broke bread together. They told jokes. They stood up against the powerful together. They walked. They taught the way of God together. They sang. They cast out demons together. They were friends. Real friends. We can speculate Judas was different from the rest. We imagine we would have seen him. Maybe he was aloof. Maybe he didn’t pull his weight. We speculate that way because we want Judas to be easily differentiated from the others. He was not. Judas sat at the table with Jesus–he dipped his hand in the same bowl as Jesus. They were friends. When Judas betrayed Jesus, he did so with a kiss. A sign of respect. The greeting of a friend. But that kiss was not as it might have appeared. Judas actually used the sweet greeting of a friend to betray Him into the hands of the soldiers. Somewhere along the path of discipleship, Judas realized his relationship with Jesus was valuable. It was a commodity he could trade to get something more valuable. Power. Favor. Money. He traded human life for money to spend, favor to call upon, for power to wield. Power over the people of God–maybe even power over God, himself. He would never have said it that way. Betrayers don’t. They somehow twist their betrayal to be a virtue. They will do this damnable thing, but, someday people will understand. They will strike down this shepherd and claim the sheep as their own–the sheep will thank them. It didn’t work out that way for Judas. There was just too much guilt. Perhaps, at some point, Judas realized his friendship with Jesus was more valuable than everything he traded it for. Maybe that is why, in the end, Judas did not even enjoy the fruits of his betrayal. Perhaps, when we see betrayers betray and then go on to enjoy the spoil of their betrayal, we should go a little easier on Judas. He wasn’t as bad as some. At least he realized the gravity of betrayal. The nation’s highest court is hearing a couple cases involving marriage/homosexual marriage. I have seen a lot of people posting for “Marriage Equality.” Some are posting red equal symbols in support of homosexual marriage and then there are a plethora of symbols against. I listened to the arguments. In my opinion, the arguments for homosexual marriage has clearly won the day. The arguments against were just weak at best and bizarre at worst. I know how the courts should rule. Let the government create whatever kind of civil unions, domestic partnerships, or whatever they want for the purpose of tax classes, federal benefits, etc. They could (and should) include homosexual unions. (For all my friends who flip out…hang on) Homosexuality, whatever you think of it, is a fact of our world. However much we may wish it otherwise, it is the way things are. To ignore what is, stomp our feet and refuse to acknowledge the families that have formed is nothing short of cruel. Beyond morality, it is a matter of compassion. People, regardless of any other factor, are still people and they deserve to be treated as ones in whom rests the image of God. Let’s dissolve all forms of civil marriage. Let every church and every religious organization take the responsibility to teach their people about the holy covenant called, “Marriage.” Let some churches explain to the homosexual couples who want to follow Jesus they are not welcome there. Let other churches welcome them. Let bodies of faith live out their faith and celebrate their religious covenants as they see fit. It seems to me this would solve the whole issue–both secular and sacred. I was going through some of the sermons from when I was at Singing Hills….Maybe there was a reason I was fired. This sermon was, from my reconstruction of the timeline, just before they approached my replacement to replace me. and if you would prefer to download it…. So, apparently there is some controversy with Rob Bell. Color me surprised. He is accused of loving homosexuals. Does that mean I approve of all their behavior? No. Does it mean I think homosexuals sometimes love God? Yes. I am challenged by the people I know in the church who are trumpeting the rebellious sanctioning of homosexual “marriages.” I am angry at the ones I know in the church who say there is no place for homosexuals. I don’t know entirely where I stand. I have homosexual friends. I want them to love Jesus. I have homosexual friends who are in immoral relationships. I have heterosexual friends who are in immoral relationships. Where do I stand? What do I say? Who do I deem Christian? I am not sure what the right answers are. I know this, however, I do have a question to answer. The question is posed to Jesus in response to a command. The answer must flow out of my soul. Where are homosexuals in the kingdom of God? I think right next to the thieves, liars and ungrateful people. People like me. I don’t know how God deals with homosexuals in particular, what I do know is how God deals with people–among which are homosexuals. He loves them. That is the final word. Whatever I think. However I believe. The final word is this, “Love.” God loves them just like He loves me. This is the first Sunday of Lent. My pastor’s sermon was about making things quiet so we can listen. Silence. We don’t get much of it in our lives. We used to live in the country and occasionally, when the snow piled up outside, the power would go out. The sudden silence could wake you from a dead sleep. We don’t hear it often. Intentional silence allows us to focus. It helps us listen for the still, small voice of God. It helps us center our soul. That works for me. It is so odd in this noisy world, that it awakes my sleeping soul. But there is also a noise that wakes my soul. It is the noise of community. Community is something Christians talk a lot about. Community is actually something humans talk a lot about. We talk about it in bars and around dinner tables and in our living rooms and in our churches. Though we talk about it, our souls remain asleep. This morning at church, I was struck by a little girl–about 10 or 12–who stood to voice a prayer request. Through choked back tears, she asked for prayer for her parents who were having problems. She wanted to say more. She couldn’t. She handed the microphone back to the pastor and we moved on. We think, “This is community.” We say, “This is community.” But it is not, for no one is awakened by it. It is not community. Instead, it is a cry for community. But we were silent. We just continued to sleep. God has shown me real kindness by allowing me to be awakened to the noise of community several times. Every time I hear that noise, it awakens my soul and I hear the still, small voice of God. I hear it in the midst of the noise of community. God, in the silence and in the noise, whisper to me, “You are not alone.” And God, please send the noise of community to that little girl. May she know she is not alone. A couple years ago I preached a sermon for my kids’ school chapel. 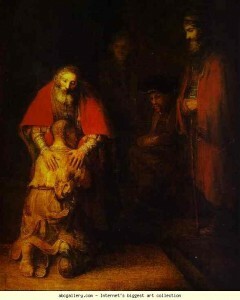 I preached the parable of the Prodigal Son. It was a sermon in which I tried to get the hearers to marvel at God’s grace towards them. This Christmas, I am in awe of Emmanuel. In awe of a God who would come among us in such a vulnerable way. Thinking about it literally brings me to tears. I have known of the incarnation all of my life. I have been a committed follower of Jesus for decades. I have taught it, preached it, prayed it, and lived it. But I can still be brought to tears when I ponder Emmanuel. What would make us too mature to hear a message about God’s love for us and His desire that we come to Him? What would make us think a Gospel message is the wrong message? I wonder if it is because the Gospel is for the unbelievers? I wonder if it is because the Gospel is simply for conversion? Not just for unbelievers to hear, but specifically for the purpose of conversion. Like a sales pitch where you put the screws to someone to shell out the cash. I wonder if it is because it makes us uncomfortable with our sin? When we preach a message of grace to a group of committed Christian people, it is like we are acknowledging we are still sinners. 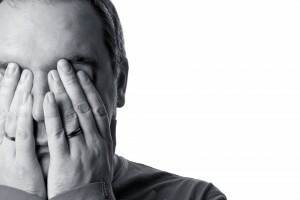 That we are still sinners is the very public secret the church believes is private. To think we, who are followers of Jesus, are still, at heart, prodigals is not a popular thing to say. At least if such a sermon were preached at a church, one could imagine it is preached for the visitor in the second row. Preach it in a room full of people who have all publicly given their allegiance to God and suddenly everyone wonders if the sermon is preached with them in mind. I am ashamed to admit I spend much too much time in the far country with booze, whores, and slopping pigs. I am ashamed that, having been adopted by God, I have boldly asked for my inheritance now. I read the Prodigal and my heart leaps. There may even be hope for me. It is me, a son, who has left the presence of God. It is me, a son, who is hoping against all hope God is still waiting for me to return. It is me, a son, who is finally realizing (again) I would rather be a servant in the household of my Father than out here slopping pigs. I have preached that sermon several times (it is a favorite of my family and they request it when there is opportunity) and at the end, I talk about the banquet the Father is throwing for the prodigal who comes home. I always choke up at that point, because I realize there is a banner over the head table, and it says, “Welcome Home,” and, it is for me. I hope I continue to hear stories of God’s grace for 1000 years. I need to hear them. It is Christmas time and I remember–back when I prepared sermons every week–hating this time of year. I always hated it for the same reason. I have to tell the same stories and preach the same texts I have preached for 25 years and still come up with something profound. Let’s face it, we’ve all seen the Christmas play at church. It is cute. Every year I combed through the texts looking for some bit of gold I had missed every other year. Every year I found it. It was always the same gold, yet it was always as fresh and profound as the first time. It is the part we miss over and over. We miss it in our church politics. We miss it in our debates over doctrine. We miss it when we twist the Scriptures to fit our political ideology. We miss it in our theology. We miss it in our study. We miss this bit of gold far too often. I miss Emmanuel. God with us. He is and was and always shall be far beyond just something profound. Wow…it has been a long time since I wrote. I guess it is testimony to the season of my life. Yesterday a man came into the store. He has bought a lot of knives from us and we always spend a bunch of time talking. Mostly knives. Yesterday, we talked life. We shared our stories. He is a college president. He doesn’t have much of a faith, but seems to be genuinely seeking God. He asked my story. I told him my knife story. He asked about why I moved to Oregon. So I told him my pastor story. I talked about my calling. We talked about the difference between rules, religion and following Jesus. Then I got to the part of my story about Singing Hills. I had to tell him how they invited me to Oregon, treated me very badly, then very unceremoniously fired me, having begun searching for my replacement just weeks after Wendy’s last surgery. “Typical church,” was his response. I wanted to scream, “It is not!” but I couldn’t. There are far too many of these mean, little churches. The Kingdom is so poorly represented by the petty “church” politics. I honestly don’t know the pressures the elders did or did not feel from the congregation. I don’t know their thought processes. I don’t know how much they prayed. What I do know is that the story of Singing Hills–especially as it intersects with my story is a terrible witness to the God who so loved the world. I wonder how many of these bloody intersections in people’s stories it takes before Jesus removes the lampstand from a local church. If people in the world we are trying to reach–if people in the world for whom Christ died keep hearing the ugly stories about the church, why would they want to be a part? The Church is the bride of Christ. She is beautiful and she has a beautiful story. Jesus died to make her story beautiful. Please tell beautiful stories about the Bride. More importantly, inasmuch as you are a part of the Church, make your life write beautiful stories about the Bride. One of the most beautiful pictures of the mighty work of God is in Isaiah 2:4. “In the end times,” Isaiah writes, “God will render decisions for many peoples; and they will hammer their swords into plowshares…” Somehow, as God draws His world into His Kingdom, we will get a handle on peace and will not lay down our swords, but, instead, we will beat them into instruments of peace. That peace is ushered in my the Prince of Peace, Himself. We live in the time when swords are to be beaten into plowshares. But I like my swords. I like them a lot. When I am attacked, I want to, with complete justification, defend myself. When I am betrayed, I reach for my sword. When I feel weak, I touch the handle rising above the scabbard. We use them when we are attacked, or betrayed or feel like we are weak. We use them on enemies who attack us, friends who betray us, or anyone who makes us feel weak. I was having coffee with a friend of mine and we were talking about the stuff that happened at Singing Hills. He was angry at how I was treated. I am angry at how I was treated. We talked about the players. We talked about the high handed nature of their betrayal. All of a sudden I realized how skilled I am with a sword. We continued talking. Before long, I had found another sword and was swinging it wildly. Not like a mad man, like a very sane one. I was one who knew who he was and knew who had betrayed him. I was one who knew the enemy and knew what to do. But these are not the times to live by the sword. These are not the times for victory via violence, for these are end times. These are times when Messiah has come and with Him has come this way of peace among His followers. 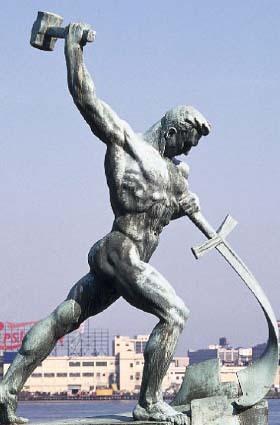 Swords are to be beat into plowshares. All of them. Beating swords into plowshares is hard work. It is much more difficult than using swords for what they were intended. Being a man of peace means that every time I draw my sword, I step up to an anvil and begin pounding. It means the denying of myself Jesus demands happens with every sword. It means the cross I bear is a cross of peace. It means the ones who betrayed me, the ones who hurt me deeply, the ones who hurt my family–those get to live. And more than that, they get to plow with my swords. I have swords to beat.